Remember the Essence Peel Off Base Coat that was launched recently, and got a lot of buzz among the beauty blogger community? 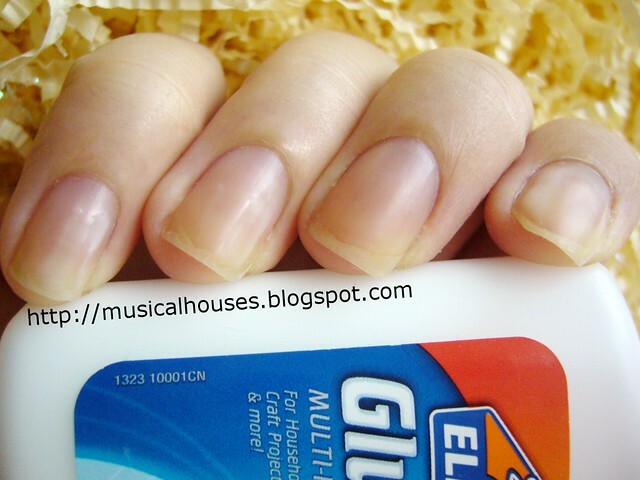 Well, it turns out there's a simple, much cheaper dupe for it - Elmer's glue! In fact, not just Elmer's - any kind of PVA glue will do. Then one astute blogger looked at the ingredients list of the Essence Peel Off Base Coat was the same as PVA glue! (Essentially it was Polyvinyl acetate (PVA) emulsion, water, and preservatives.) Looks like Essence has been repackaging PVA glue and selling it as Peel Off Base Coat! So I thought, why don't I just use PVA glue, instead of trying to get the Essence version? Cheaper, easier to get, and not LE or sold out. And if you're in Asia, like I am, you don't have to wait months for it to be launched in your locality, only to be ripped off by the fact that it's PVA glue. Score! Turns out, I wasn't the only one with the idea. Other bloggers had tried this out too (in addition to Labmuffin, the original astute blogger, you can see others here, and a DIY version here.) So, in the knowledge that I wasn't the only crazy one with this idea, I tried it out. I got a small bottle of Elmer's glue, and then, all excited, without further ado, I started work. I was too lazy to decant the Elmer's glue into a nail polish bottle, so I dumped a big blob of the glue out on a sheet of paper, and just dipped a clean nail polish brush in the blob, and painted my nails that way. When I first painted my nails with my Essence Peel Off Base Coat dupe, they looked like this. That is to say, they looked like I had glue on them (which, by the way, is how the real Essence Peel Off Base Coat looks when you first put it on too, according to the blogs I've read). But when I first saw my nails, I had this "OMG WHAT DID I JUST DO? I PUT GLUE ON MY NAILS!" moment. It felt a little crazy, I won't lie. The good thing about using PVA glue is that if you make any mistakes with the base coat, you can clean it up with water, or just wash it off entirely with water. So in a way, it's even easier to handle than your normal base coat. I know, gorgeous, right? The best part? 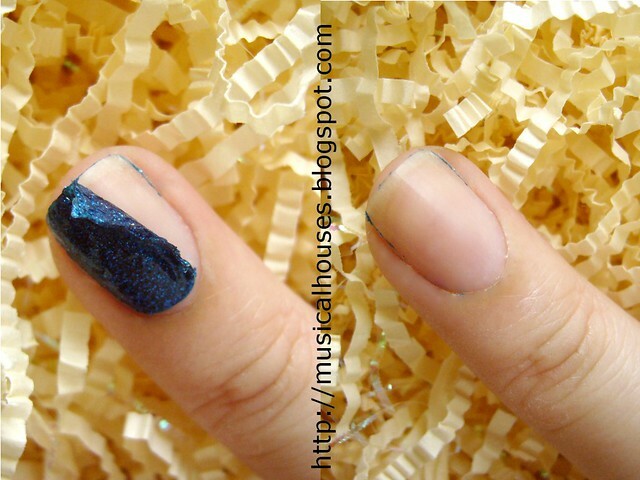 The easiest glitter removal ever - just peel off the entire polish right off your nail! I was really psyched at being able to just peel off the polish - it's even more convenient than the foil method! One of the questions I had about using PVA glue was the water resistance of the glue. After PVA glue is water soluble (so is the Essence Peel Off Base Coat), so I was worried that even after the glue had dried, the manicure would still come loose when I showered or washed my hands. Other bloggers had mixed results - some reported 4 days without incident (here and here), while others had only one day before chipping (here). That's something I've yet to try out, since I haven't tried wearing the PVA Glue base coat for a few days yet. Still though, if it lasts, it would be fantastic. Updated: I tried out the PVA glue as a base coat for an NOTD wear test, and it did great! Check out my Elianto Burnt Umber NOTD post for more details! Another thing to note of course, is safety. Based on the ingredients list in the Essence Peel Off Base Coat, a mixture of PVA emulsion and water (found in the Essence version) probably won't harm your nails if you use it topically. So I imagine most PVA glues would work. Just don't use superglue! And if you are unsure, check the ingredients before buying or trying on your nails. The good thing? It's washable with water, so if you try it and don't like it, just rinse it off. 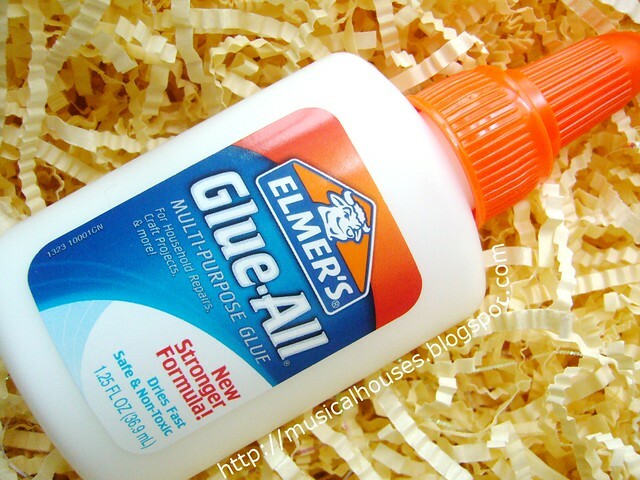 So, would I ever try out something as crazy as using Elmer's glue as a base coat? Well, to be honest, I actually think I would! I can see how a peel-off base coat would be useful for glitter manicures, elaborate nail art that would be a pain to remove, and also for swatching, especially swatching of multiple glitters in a row. Basically, if it's going to be a pain to remove, and I don't intend on wearing it for all that long (say maybe 2-3 days), I'd use the glue method. But for plain ol' creme manicures, I'd probably just use a normal basecoat. Isn't it awesome! And cheap too! Thank you, I've been looking for something like this everywhere! Neat. Going to try this out. I wonder if you could use it to paint *around* your nails for easy clean up after they dry. @Rai: You mean like paint the edge of your nails with glue and wash them off later? I honestly haven't tried it, would be keen to know how it is when you try it! I keep seeing this all over the place! I still have that little voice in the back of my head going: isn't this bad for your nails? The reason I say this, doesn't it damage the nail when you pull off polish? Isn't this the same thing? @Beauty on a College Budget: I've done it a few times now, and I don't think it damages the nail when you peel the base coat off. It's not the same as peeling polish off. 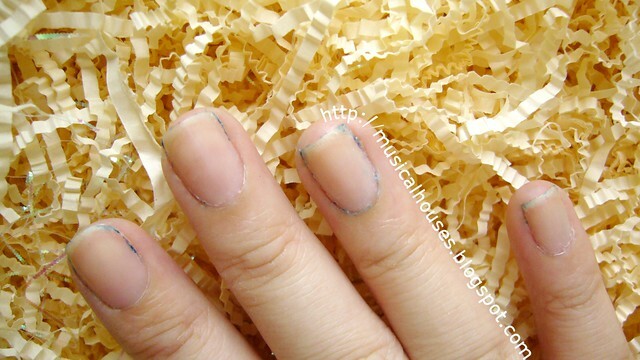 PVA glue doesn't adhere to your nail the way nail polish does, so it's more like peeling a piece of plastic off your nail, whereas peeling polish off your nail is more like peeling lacquer off a piece of wood. That said, peeling polish off your nail in itself isn't harmful to your nail - it's only harmful if you inadvertently peel off part of your nails as well. If, say, for example, the piece of polish is already peeling off and falling off your nail, and you peel it off where it has already come off, it isn't going to hurt your nail. However, if the polish is still stuck to your nail and you try to forcibly peel it off, then you really run the risk of peeling off the top layer of nail with it too. Ugh why don't I have Elmer's glue in my house right now?!! Gotta try this! Also must try Rai's clean up idea!!! Thanks for posting this! It's almost like a PSA! PVA is not a solution but an emulsion in water. The film it forms after it dries down is not water soluble. @Anonymous: Ahh, thanks! That does help to clear up the questions I had about using PVA glue as a base! I'm from Singapore, where did u get the elmer's glue from? Also do u still use it for every glitter mani? 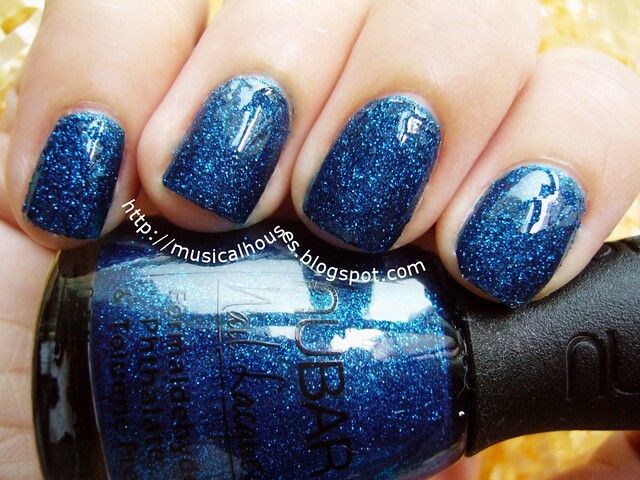 I got a number of glitter polishes lately, so am keen to try this! Thank you so much for letting me know.. i am gonna check out Art friend @ Taka soon... hopefully can find it there! Deleted the extra comments now. HAPPY NEW YEAR!! So how long does it last?but i can ikagine that with washing upbin bot water it would melt??? @s oakley: I've tried this a number of times, it lasts for a few days (4-5 days) on me, but my job doesn't involve immersing my hands in water. That said, once the glue is dry, it becomes solid and will not dissolve off in water. So it won't melt if you are washing up in hot water. However, since you have a job that's rough on your hands in general, it may last shorter on you as it might chip off or peel like normal base coats. So how long doss it last?i think if i have jot bath or wash up ot must be melted no? doesnt melt in hot water?